If the quantity of concrete is not much enough to do with ready-mix and is not less enough to do with hand mixing then mixture machine is used to mixing concrete. 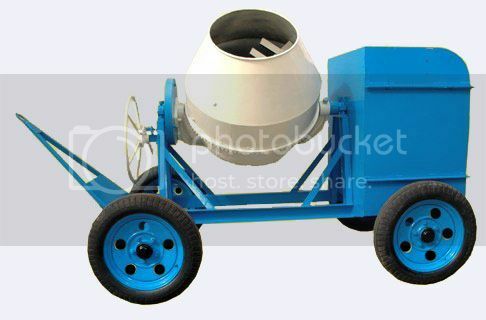 It is convenience to use mixture machine for mixing a small quantity of concrete. Producing concrete with mixture machine is much faster than hand mixing. Normally the capacity of mixture machine is 4 to 9 cubic feet of concrete. Mixture machine can be bought or rented. Arrange and stake all required tools and materials such as concrete ingredients, bucket, shovel and measuring can before starting the machine. Keep a drum of water near mixture machine. Clean the excessive dust from aggregate with water. Maximum 3% dust by volume is allowable. Measure the coarse aggregates and fine aggregates by a can equivalent to the volume of a bag of cement. Make sure the formwork, which you are going to fill with concrete, is properly supported and leakage-proof. Make sure the path between mixture machine and the pouring place is easily accessible. Add half of the required material (aggregates) of a batch. Add a small amount of water in the drum of the mixture machine. Then add a bag of cement. It is better to make the batch for a bag. Add remaining aggregates as per required proportion in the drum of the mixture machine. Decide what should be your water-cement ratio and measure the water bucket for how many buckets of water will need for a bag of cement. Thoroughly add required quantity of water. You can control water quantity by measuring the slump. Mix the concrete ingredients not less than two minutes after all materials are in the drum. Gradually add the remaining water and keep checking if the concrete mix is uniform or not. Nice blog. keep sharing such a informative post.